The Holland College Foundation honoured Jan Cowper, Irwin MacKinnon, and David Poirier as Distinguished Alumni during the eleventh Distinguished Alumni Awards ceremony held at the Tourism and Culinary Centre recently. Foundation Board Chair Ron Keefe said that the 2018 Holland College Distinguished Alumni Award recipients are excellent representatives of Holland College, and that each should be commended for their accomplishments and their commitment to their chosen profession. Cowper is a 1990 graduate from the college’s Dental Assisting program. She is currently the team leader of Federal Programs for the Medical Authorization Centre-Dental for Medavie Blue Cross in Moncton, NB. Jan was instrumental in the development and implementation of the National Dental Assisting Examination Board’s clinical practice exam and has been active in her professional association since graduation, having held leadership positions at local, provincial, and national levels. MacKinnon is a celebrated chef who has been honoured with numerous regional and national awards, including the Culinary Federation Eastern Region Chef of the Year and the Canadian Culinary Federation's Chef of the Year Award in 2018. He is president of the PEI Chefs’ Association and was inducted into the Honour Society of the Canadian Culinary Federation in 2014. MacKinnon graduated from The Culinary Institute of Canada’s Culinary Arts program in 1988, and has served as the Executive Chef at Papa Joe’s for 27 years. Poirier is a 1977 graduate from the Police Science Cadet program at the Atlantic Police Academy. He has been Chief of Police for the City of Summerside since 2006 and, in 2017, was awarded the Canadian Police Exemplary Long Service Medal for 40 years of distinguished service. 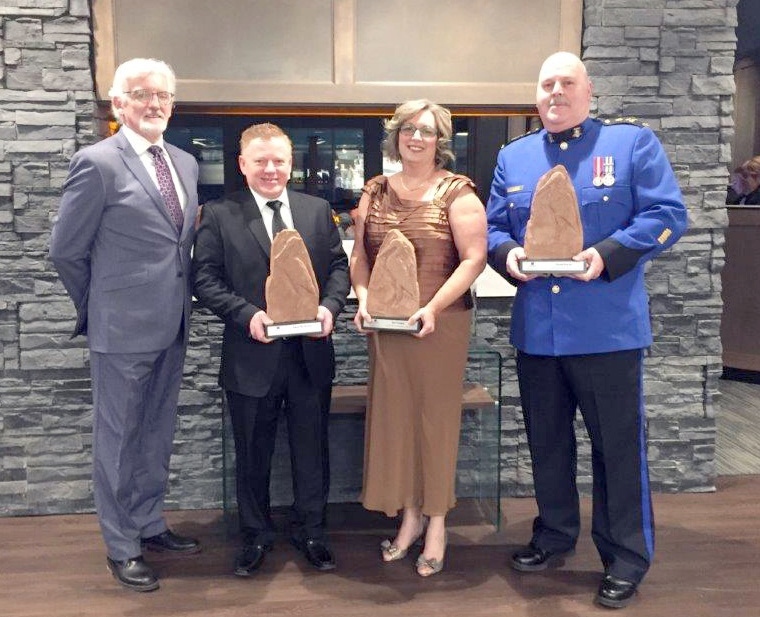 Poirier has been recognized both locally and nationally for his contributions to the community and has received numerous awards, including the Queen’s Diamond Jubilee medal, and the Municipal Police Officer of the Year Award. Cowper, MacKinnon, and Poirier join past recipients Melody Dover, John Sylvester, Melanie Wildman, Scott Annear, Patti Larsen, David Trainor, Wayne Stewart, Cory LeDrew, Kevin Proude, Sue LeFort, Delaney Chisholm, Norma Lee MacLeod, John Ledwell, Paul Livingston, Robert Webster, Barry Sheen, Kathy Ward Doucette, Steven Barber, Tim Banks, Louise Vessey, David Garcelon, Basil Stewart, Jeff Poirier, Eva O'Hanley, Jamie Hill, Sonya Corrigan, Alan MacLeod, Steven Collicutt, John Avery, Brent Blackmore, Alanna Jankov, and Kevin O'Brien as Holland College Distinguished Alumni. A display celebrating all alumni who have been honoured with the award is located at the college’s Prince of Wales Campus in Charlottetown. Holland College president Dr. Sandy MacDonald said that alumni are paramount to the Holland College success story.